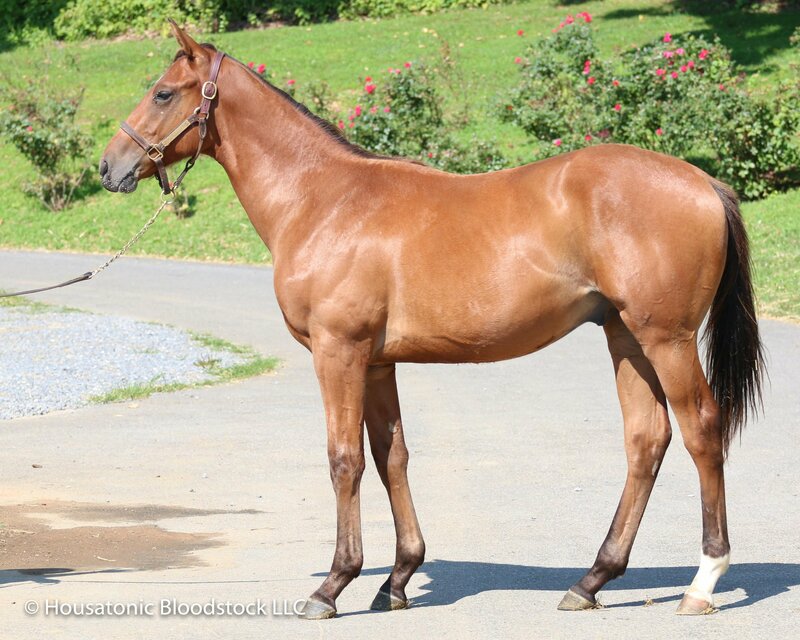 -- This Maryland-bred Discreet Cat colt out of a Curlin mare had a lovely conformation. The horse walked correctly and cleanly and vetted cleanly, too. You can see from the write-up below that Zoe Valvo (trainer) likes the horse's potential and athleticism. 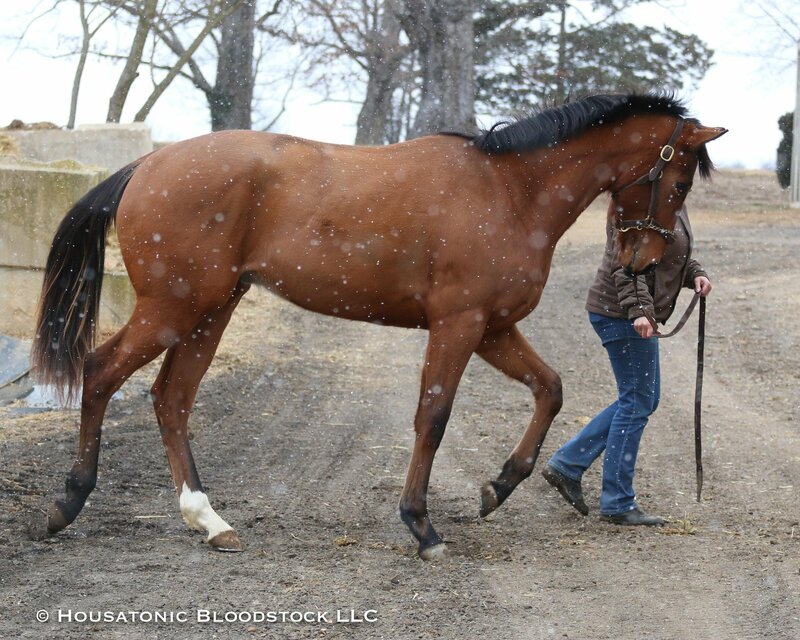 -- The horse will be staying in Maryland and will be competing for Maryland bonuses. In addition the horse is Virginia-certified, so he also qualifies for all Virginia bonuses as well. This horse came out of our 2018 Yearling Program. 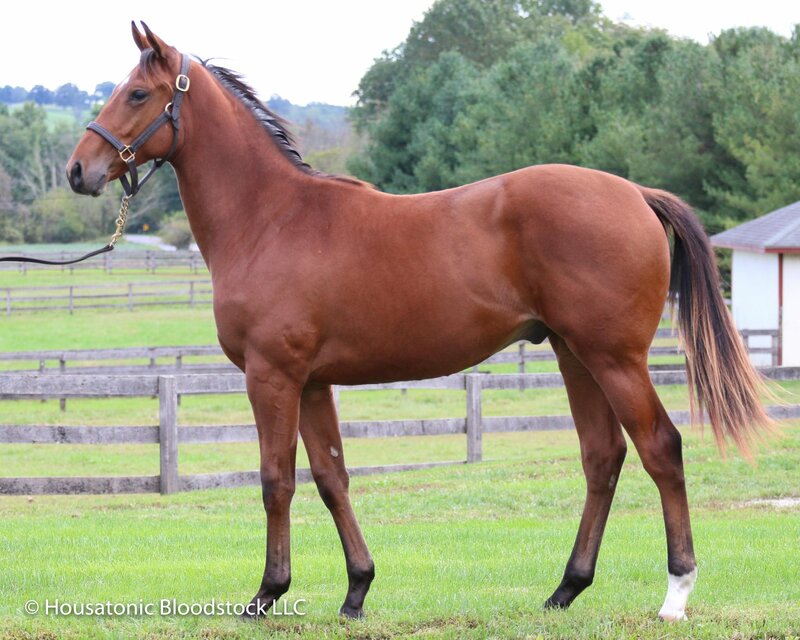 We purchased this colt for $10,000 at the 2018 Fall Fasig Tipton sale. Expenses from the last year and out of our yearling program brought the price for this horse to $31,000. As it was not a claim and because the horse will have some months of training before it begins racing, we are including 2 months of estimated training bills ($5,000) to offset the initial cost. These costs will, of course, be settled when this horse concludes his racing career with us. NOTE on NAMING: Although the horse came with a name, Start from Scratch, we are going to run a naming process on the horse. Anyone that becomes a part of this 2 YO will have a vote in the naming of him. For each .5% you own, you get 1 vote on the name selection from the three final name choices. Discreet Cat was billed as the “World Champion” 3-year-old colt of his year, and was a brilliant racehorse who has sired numerous top class runners during his stud career. Successful in a 6 furlong Saratoga maiden special weight race (over future Grade 1 winners Thorn Song and Political Force) in his only juvenile start, Discreet Cat was purchased by Godolphin and resurfaced the following spring in Dubai, where he was a romping winner at a mile before stretching out to take the UAE Derby-G2 by 6 over a field that included eventual Horse of the Year Invasor. Returned to the States that summer, Discreet Cat took a 7 furlong Saratoga allowance race by 11 lengths in 1:21.53, then triumphed in the Jerome-G2 by 10 and the Cigar Mile-G1 by 3 in a track record-equalling 1:32.46 (giving actual weight to top older horses), remaining perfect through 6 starts. Returning as a 4-year-old, Discreet Cat wasn’t quite the same, finishing 3rd in the Vosburgh-G1 and the inaugural Breeders’ Cup Dirt Mile from three starts. In the breeding shed, Discreet Cat has sired the likes of Grade 1 winners Discreet Marq, Dads Caps and Secret Compass, and his other Graded winners include Discreet Dancer, Mamma Kimbo, Sage Valley, Debt Ceiling, Out of Bounds, etc. The mating of Curlin’s Needle to Discreet Cat is good for a “B+” TrueNicks rating, based on the cross of Discreet Cat with mares from Mr. Prospector-line sires. In fact, of Discreet Cat’s top class runners listed above, only Secret Compass and Mamma Kimbo are without Mr. Prospector in their pedigrees. Furthermore, Discreet Marq, Debt Ceiling and Too Marquet are all out of mares by Marquetry, a Mr. Prospector grandson who also contributes a cross of Vice Regent, of which Curlin’s Needle has two herself. The dam of Discreetness is bred on a Mr. Prospector over Vice Regent cross, and although Mamma Kimbo has no Mr. Prospector, her second dam is by Vice Regent’s grandson Silver Deputy. 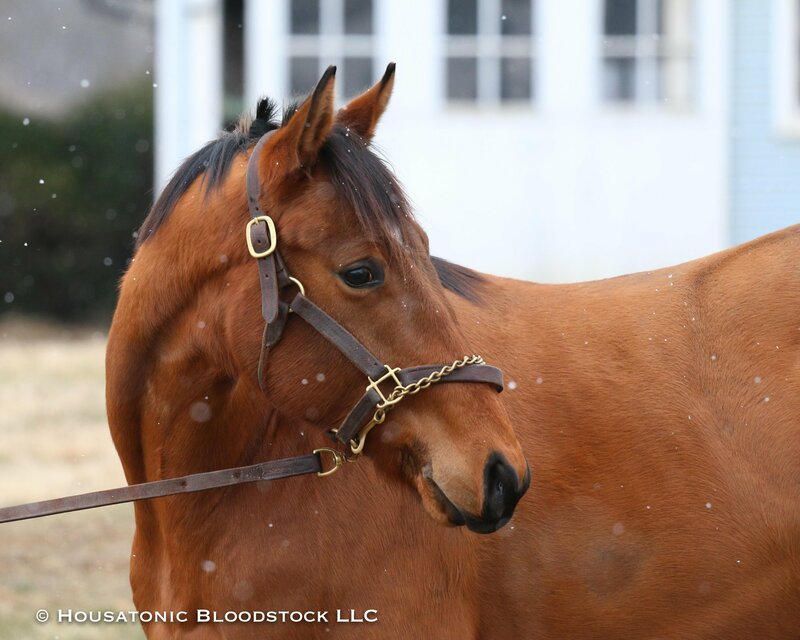 The female family of Curlin’s Needle has also had success when crossed with Storm Cat-line sires like Discreet Cat. For instance, Curlin’s Needle herself is a half-sister to a winner by the Giant’s Causeway stallion Aragorn, while her close relative Eye of the Sphynx has produced Bigstormbrewin’, a winner of over $283,000, by Stormy Atlantic. And Quiet Reward, like Curlin’s Needle a granddaughter of Queen of Egypt by a Mr. Prospector-line stallion, has produced the stakes winner Behemoth by Giant’s Causeway. Start From Scratch's pedigree contains inbreeding of 5x5x5 to Northern Dancer (plus Curlin’s Needle herself contributes two crosses of both Vice Regent and No Class). Scratch has been in traing with me for 6 months, it’s been a great experience to watch him grow and turn into the young racehorse he is today. He was a pleasure to break and has been very professional every step of the way. He has has a great attitude towards training, yet also very playful, he likes to throw a surprise buck in every now and again which I love to see in a horse because you know he’s enjoying what he’s doing. He’s got a great athletic build to him, and strides out nicely over the track. Overall he’s a lovey young colt with a lot of potential ability. Just pick .5% to 5% of the horses you want + 99/horse. Join the Wasabi Ventures Stables Co-Owner Club Now.